Eating for taste is awesome. Eating for the benefits of what different foods provide, nutritionally and physiologically, is even more awesome. Sweet potatoes help curb sugar cravings and ginger helps reduce inflammation. 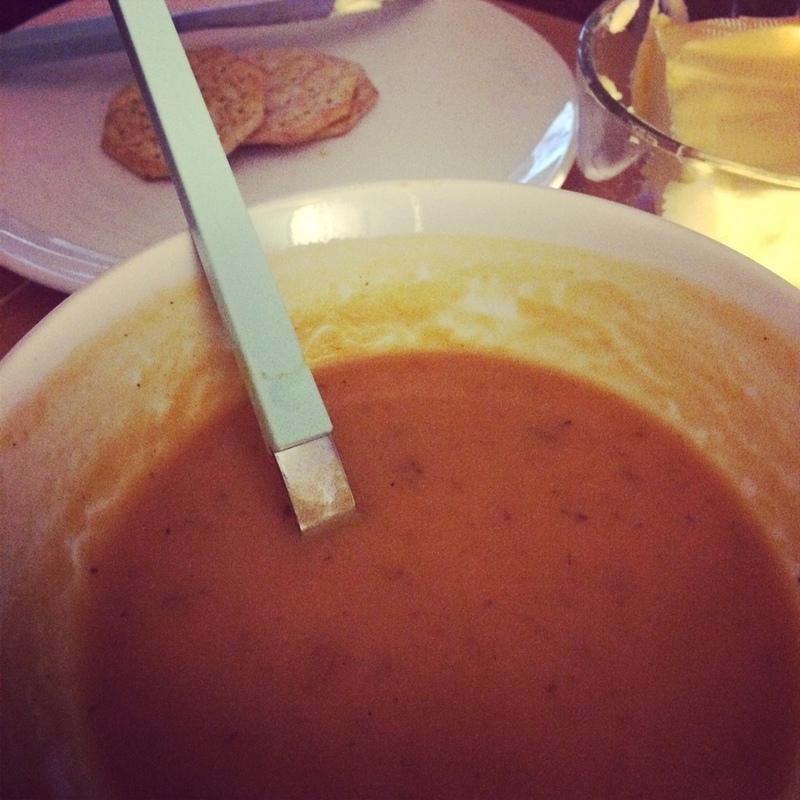 I made up this recipe and it was really tasty and may help with whatever ails you this winter. In a large pot, bring diced sweet potatoes and 3 cups of water to a boil. Add bouillon cube and sliced ginger and cook until potatoes are soft. Reduce heat and simmer. In a small pan, melt butter and cook onion until translucent. Add onion mixture to sweet potato pot and blend with a hand-held blender until smooth. Fold in coconut milk and thyme and simmer for 3-5 minutes. Serve over your favorite cooked whole grain or crackers and cheese--whatever makes you happy! This was one of very few meals I've made with no recipe to follow. I made this up all by myself. And I think it turned out pretty good! It's super close to vegan, you can easily make it without the ghee. But I am willing to bet it would drastically change the flavor of this luscious soup. To my vegan readers, give it a try and let me know what you think! 1) In a large soup pot, add ghee and onions. Cook onions until they are translucent. Add sweet potatoes and enough water to barely cover them. Bring potatoes to a boil and cook until soft. 2) With an immersion blender, puree potato and onion mixture until smooth. Add in spices and simmer for 10 minutes. Fold in coconut milk and add lentils. Simmer over very low heat for 10 minutes. 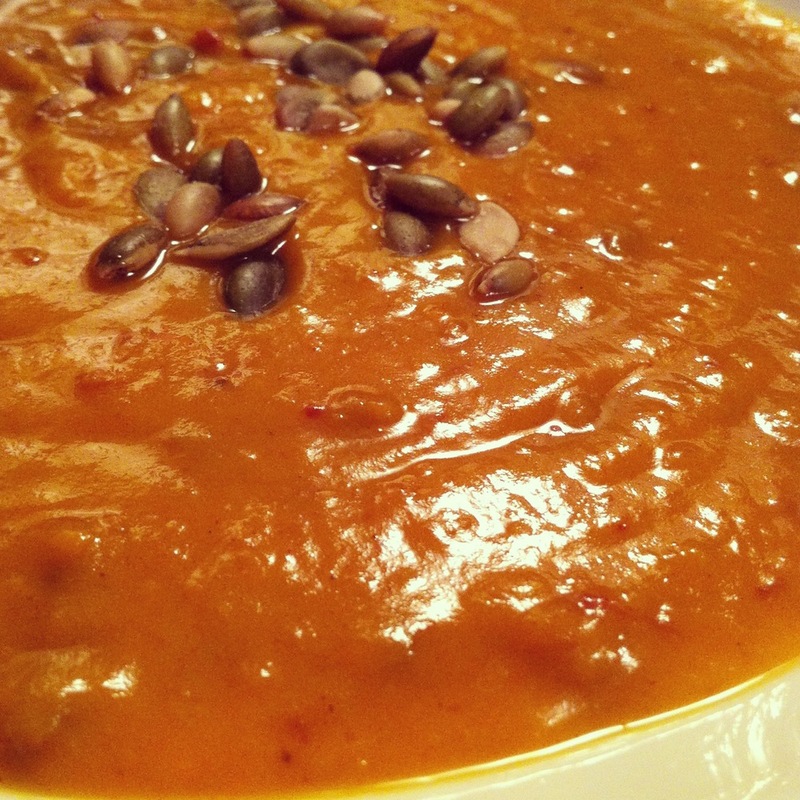 Stir and serve hot with pumpkin seeds as garnish. It's Sunday night--maybe 4:45pm. You had a busy weekend, you're tired, you're hungry. Take-out options: sushi, pizza, Thai, Italian. It's moments like this where I fully realize and appreciate how different my life is from just a few years ago. Why spend my hard-earned money on dishes made by other people when I have the ingredients and know-how? Why not take time out from working and rushing around and spend an hour preparing a wholesome meal for myself and my partner? This is how I think now, as a health coach. loved this comment from a pal the other day, "making this tonight, thanks for the inspiration." two large sweet potatoes, sliced or diced. Your choice. 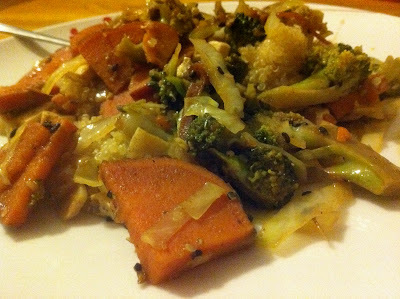 2) add the sweet potatoes and broccoli. Dense veggies need more time to cook, so add them first, then the cabbage. 3) Stir over medium heat. 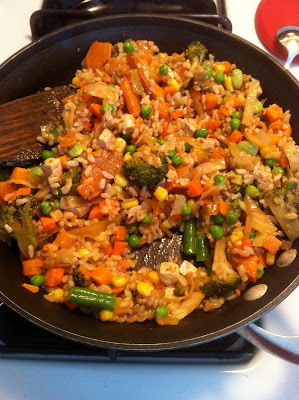 4) when the veggies are softened to your liking, add the garlic and seasonings. 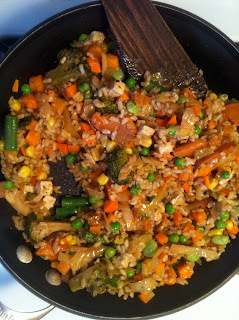 Toss and serve over rice or quinoa.